Carmanah Lighthouse, built in 1891. The West Coast Trail had its beginnings in the days of the sailing ship. Since the early 1800s some 250 vessels were lost to severe coastal storms and poor navigational equipment, resulting in the west coast of Vancouver Island being called the “Graveyard of the Pacific”. Governments of the time made a number of efforts to help the situation. Lighthouses at Cape Beale (1874) and Carmanah (1891) along with construction of the West Coast Telegraph (1890) were measured responses to the dangers of sailing this treacherous section of coast. The lighthouses are still functional and can be visited when hiking the West Coast Trail. The tragedy of the passenger steamer Valencia in 1906, with 164 lives lost, resulted in the original West Coast telegraph line being upgraded with trail improvements to become the “Lifesaving Trail”. 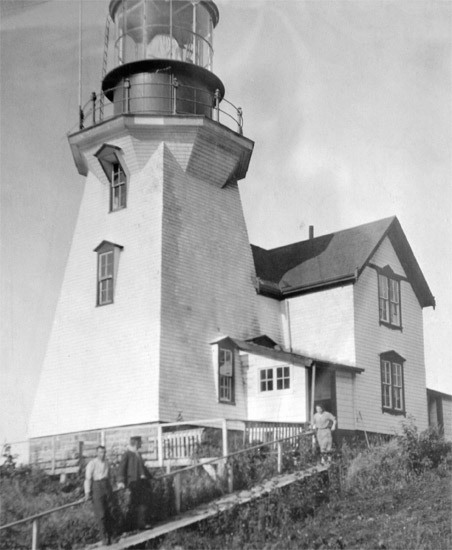 In 1907 a third lighthouse, near the wreck site at Pachena Point, was completed. Time and cost eventually took its toll and the Lifesaving Trail was limited to the section from Bamfield to Carmanah Point. Beyond Carmanah the trail followed the original telegraph line. These developments did result in many lives being saved in subsequent years. After the 1940′s, with the development of more sophisticated navigation equipment eclipsing the technology of the past, trail maintenance was discontinued. Parks Canada undertook a major redevelopment in the 1970s to create one of the best known and most challenging hikes in North America, the West Coast Trail.